Catering to individuals from fields such as agricultural science, climate science, conservation biology, ecology, forestry, geodesign, geology, geophysics, health sciences, hydrology, ocean science, social sciences, and sustainability science, the symposium aimed not only to discuss pressing global issues in relation to science and society, but congregate the scientific community typically scattered throughout the week of UC. 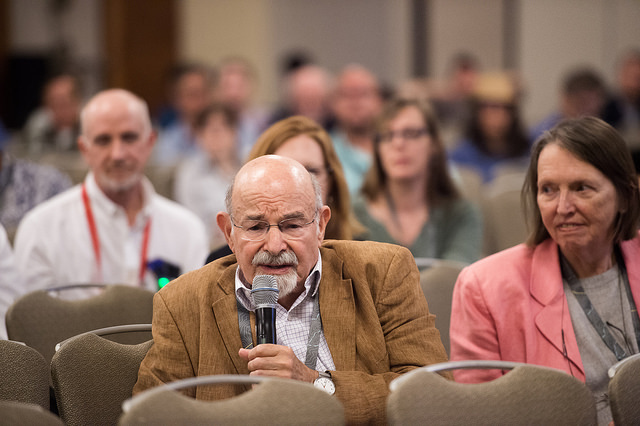 The Science Symposium collected members from the scientific community such as Harvard professor of landscape architecture and planning Carl Steinitz. Though the event was open to UC participants as well as the Education GIS Conference , due to the overwhelming response, registration for the Science Symposium reached capacity well in advance. 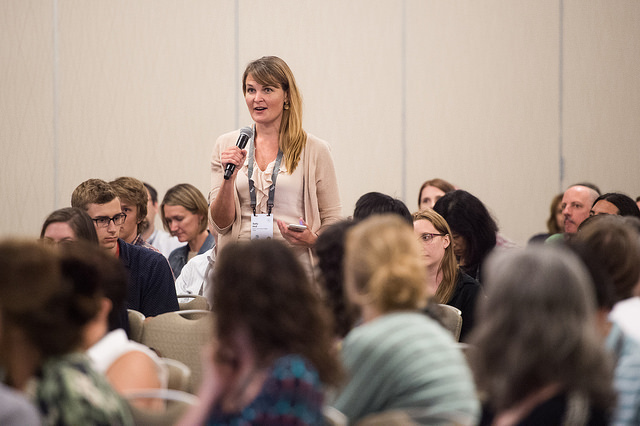 As a result, nearly four hundred scientists convened at the Marriott Marquis June 28th, conveniently located adjacent to the San Diego Convention Center. An audience of domain scientists interact with the keynote speaker and the discussion panel during the Q&A session. 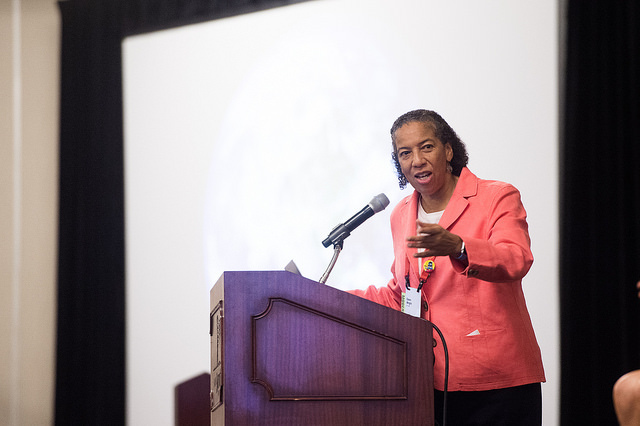 Divided into four components, the symposium featured an exposition from keynote speaker Dr. Margaret Leinen, a discussion panel with distinguished GIScientists, an audience Q&A, and a networking reception among peers, drinks, and delicious appetizers. Photos from the event by Bernadette Gerber can be found on Flickr while reactions from the meeting were captured on social media and organized through Storify. Keynote speaker Dr. Margaret Leinen discusses GIS’ role in understanding the earth’s natural systems. 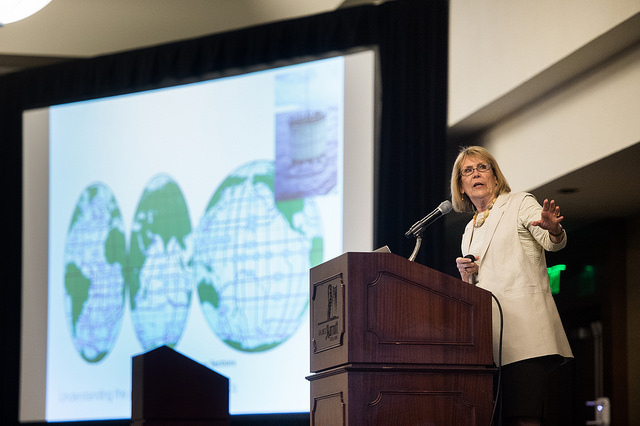 For her keynote address “What will be necessary to understand and protect the planet…and us?”, Dr. Leinen walked the audience through the power GIS affords science to understand the world around us with innovative statistical modeling and data arrays. As the director of the Scripps Institution of Oceanography at UC San Diego and president of the American Geophysical Union, she spoke on the impact of climate change and the interconnectivity of change in the sea surface temperatures, seismic activity, and fire growth in Southern California. 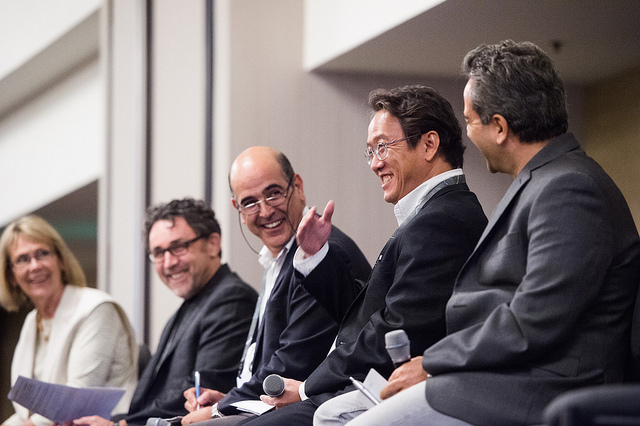 Dr Leinen alongside discussion panel members John Wilson, Marco Painho, Ming Tsou, and Cyrus Shahabi. Afterwards, the symposium’s discussion panel expounded upon Dr. Leinen’s sentiments. The panel was moderated by Mike Goodchild (UC Santa Barbara Geography emeritus), and consisted of John Wilson (USC Spatial Sciences Institute), Marco Painho (Universidade Nova de Lisboa Geography), Ming Tsou (San Diego State Geography), and Cyrus Shahabi (USC Computer Science). Among several points, the panel posed observations about the construction of maps, such as scale, color, and classification, and proposed that spatial scientists derive and test theories for improving the world in place of just using academics to describe the plight of the planet. With an eye to 2017, the next Science Symposium will feature a domain science keynote delivered by Jon Foley, executive director of the California Academy of Sciences, and a fresh GIScience panel in response.